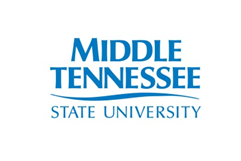 The Department of Psychology at Middle Tennessee State University (MTSU) invites applications for a full-time, tenure track faculty position in Clinical Psychology at the assistant/associate professor rank. Special consideration will be given to those with behavioral and/or CBT training. The start date for this position is August 1, 2019. The position requires undergraduate and graduate teaching, thesis supervision, and the development of a research program. Teaching may include Behavioral Assessment and Interventions courses and other graduate clinical psychology courses; undergraduate teaching may include Behavior Modification or Abnormal Psychology. When fully staffed the Psychology Department at MTSU has 36 tenure track faculty, 5 graduate programs, 3 undergraduate majors, and 5 minors. The Clinical Psychology program prepares students for employment at the Master's level or to continue for doctoral study. Tracks include psychological assessment, applied behavior analysis, and health/neuropsychology. Course work is in preparation for employment in clinical assessment and/or applied behavior analysis. Other Desirable: Candidates from an APA-approved program and internship, those eligible for licensure in TN as a Health Service Provider, and those with graduate coursework in behavioral assessment and interventions will receive special consideration.